If you are planning to a Synology RAM upgrade for your NAS, but you dont know where to start, you have came to the right place! Synology DS1511+/ DS1512+ / DS1513+ / DS1515+ / DS1517+ network attached storage devices are advanced NAS devices that DO support memory expansion. These NAS devices are compatible with different memory types and have different maximum supported RAM volumes. If you are using your DS151x+ NAS in office settings where multiple computers are connected to your NAS, there is a chance it will not have enough power to serve all data requests. The additional memory will be used as a buffer when handling multiple file transfers at once. Now lets take a look how adding the memory works for all DS15xx models. Synology DiskStation DS1511+ has 1GB of RAM preinstalled, and total RAM can be expanded up to 3GB. It has one extra memory expansion slot, so you can add 1GB or 2GB RAM upgrade. The factory installed RAM module of 1GB is in fact installed in the regular memory slot. It theoretically can be replaced with another larger volume module, but you should keep in mind that if you tamper with preinstalled RAM module, the warranty will be void. These systems also do not recognize more than 3 GBs of RAM, so adding 4 GB or more will be a waste of money. At the same time, I have read that people are experimenting with adding 4GB memory module to the DS1511+ storage device, and they say that their unit is recognizing it. It is not clear if such increase will improve the performance even more than adding 2GB memory, and what is the manufacturer’s stance on this. I still have to investigate this. 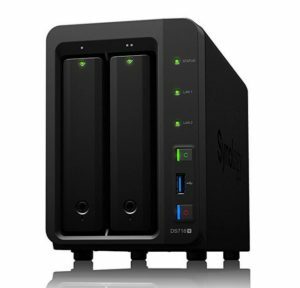 Synology DiskStation DS1511+ supports 800Mhz (PC2-6400) 200Pin SODIMM modules that are typically used in laptops. According to DS1512+ users, this machine recognizes 4GB of RAM. To install 4 gigabytes, you will have to remove the 1GB module and replace it with 4GB module. Here comes the tricky part. If you are planning to install two pieces of 2GB modules, you have to find the specific type of module – Single Rank memory. The quickest way to identify Single Rank memory module is to read its label. Single Rank has a 1Rx on it, for example, 1Rx4 or 1Rx8. In other words – if you will upgrade to 3GB, don’t worry much and get the DDR3-1066 unbuffered So-DIMM 204pin CL=7 1.5V. If you will upgrade to 4GB, you should make sure you get Single Rank modules. Please check out this discussion to learn more about upgrading to 4GB RAM. Add one 2GB RAM module. The Synology DS1515+ comes with pre-installed 2GB of RAM that can be removed from the NAS. The official guidelines state that you can only add 4GB to get total of 6GBs of memory. That is not exactly true. One thing you should keep in mind – adding non-Synology RAM stick to preinstalled 2GB likely will NOT work, so you will have to remove it from your storage. 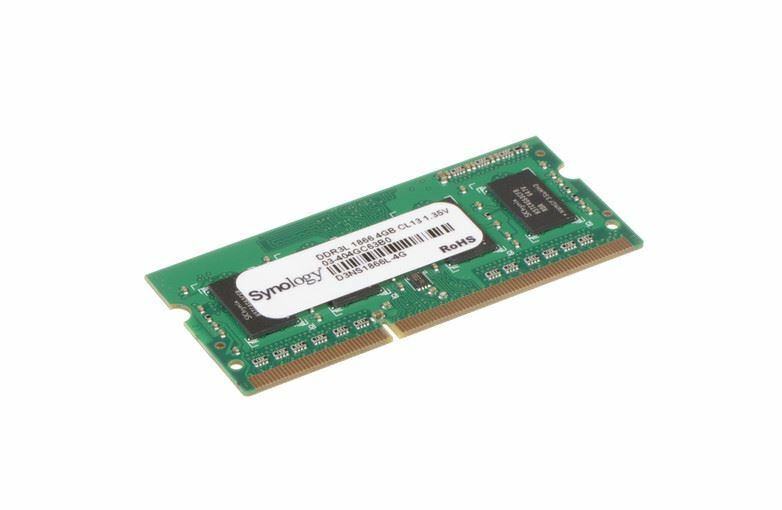 The Synology DS1517+ comes with either 2GB (1x 2GB module) or 8GB (2x 4GB modules) of RAM preinstalled. I am working on the additional chapter for this guide which will explain how to add memory to other models that support this feature. Here is a table with Synology RAM modules for NAS listed that are available at the end of January 2019. Can Other Types Of RAM Be Used? Sometimes people have extra memory modules at home that they have laying around after upgrading their equipment. They are asking if similar types of notebook memory modules like PC2-5300 can be used? The answer is NO. Even if the memory module fits in your storage, you will see the performance decrease as the old module will act as a bottleneck. Always use the memory modules specified by the equipment manufacturer, and your device will function at its best and serve you long time. What Are The Synology RAM Upgrade Benefits? If you are using your NAS for occasional file downloading and sharing among a couple of computers, you might not see obvious increase in performance. But if you use you device for resource hungry applications and multitasking, the expanded RAM will ensure smooth data processing and swift performance. After installing the additional memory first thing you will notice is the improved responsiveness of application user interfaces. And this is only the tip of the iceberg.